Pesticides are chemicals or biological agents that kill plant or animal pests. They include herbicides, insecticides, fungicides, and rodenticides. More than a billion pounds of pesticides are used in the U.S. each year to control weeds, insects, and other organisms that threaten or undermine human activities (Grube et al., 2011). Some of these compounds can be harmful to humans if ingested, inhaled, or otherwise contacted in sufficient quantities. The primary routes of exposure for the general population are ingestion of a treated food source and contact with applications in or near residential sites. Exposure can also result from contaminated water. Those who manufacture, formulate, and/or apply these chemicals, as well as individuals who work in fields treated with these chemicals, can also be occupationally exposed (CDC, 2009). This indicator reports the results of human biomonitoring for three classes of non-persistent insecticides and one class of herbicides, which can be measured through metabolites that result from the chemical breakdown of the pesticide within the body. Measurement of non-persistent pesticide metabolites in urine typically reflects recent exposure (i.e., in the last few days) due to the short time these metabolites remain within the body (CDC, 2009). The three classes of insecticides covered by this indicator are carbamates, organophosphates, and pyrethroids. Carbamate insecticides have a wide variety of uses, which include applications on agricultural crops, residential lawns and gardens, and golf courses. Carbamate insecticides do not persist long in the environment, so they have a low potential for bioaccumulation. Organophosphates are used to control a broad spectrum of insects. Although organophosphates are still used for insect control on many food crops, most residential uses are being phased out in the U.S. Pyrethroids are synthetic analogues of pyrethrins, which are natural chemicals found in chrysanthemum flowers. All three groups are neurotoxicants that act by overstimulating the nervous systems of exposed organisms. Symptoms of exposure to pesticides in these classes include muscle weakness or paralysis, difficulty breathing, difficulty concentrating, impaired coordination, and memory loss (CDC, 2009). The herbicide group discussed here is chlorophenoxy acids. Symptoms of acute high-dose exposure to these herbicides can include skin and mucosal irritation as well as burning sensations in the nasopharynx and chest if inhaled (Roberts and Reigart, 2013). This indicator presents pesticide urinary metabolite data collected as part of the Centers for Disease Control and Prevention’s (CDC’s) National Health and Nutrition Examination Survey (NHANES). NHANES is a series of surveys conducted by CDC’s National Center for Health Statistics that is designed to collect data on the health and nutritional status of the civilian, non-institutionalized U.S. population using a complex, stratified, multistage, probability-cluster design. CDC’s National Center for Environmental Health conducted the laboratory analyses for the biomonitoring samples. Beginning in 1999, NHANES became a continuous and annual national survey; biomonitoring for certain environmental chemicals also was implemented. Data for 1999-2000, 2001-2002, 2003-2004, 2005-2006, and 2007-2008 are presented, when available. This indicator presents data for a subsample of survey participants age 6 years and older. NHANES also measured levels of a class of persistent pesticides, the organochlorine pesticides, which are not discussed here but can be found under the Serum Persistent Organic Pollutants Level indicator. 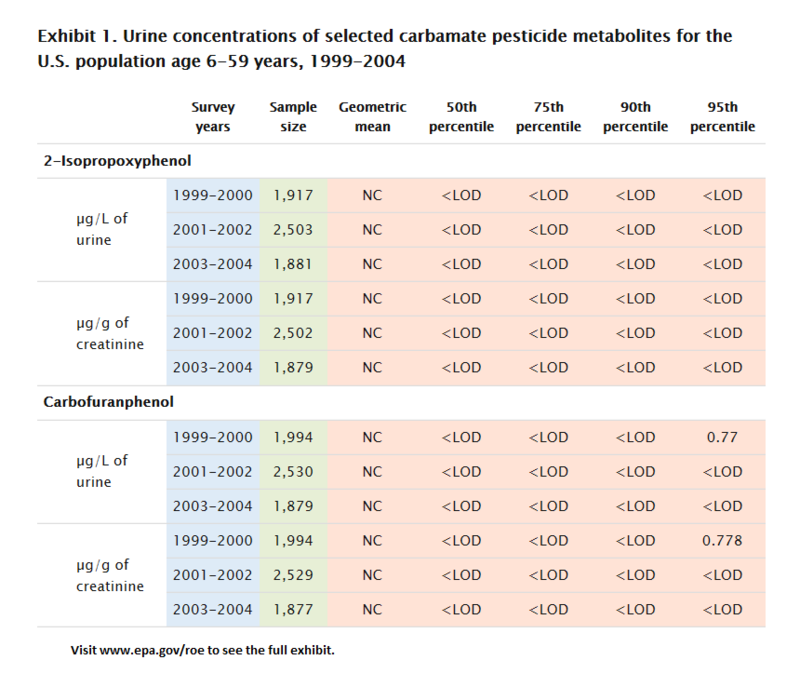 Exhibit 1 presents values for unadjusted and creatinine-adjusted urinary concentrations of the carbamate pesticide metabolites. Of the metabolites presented, none were detected with sufficient frequency to calculate a geometric mean. 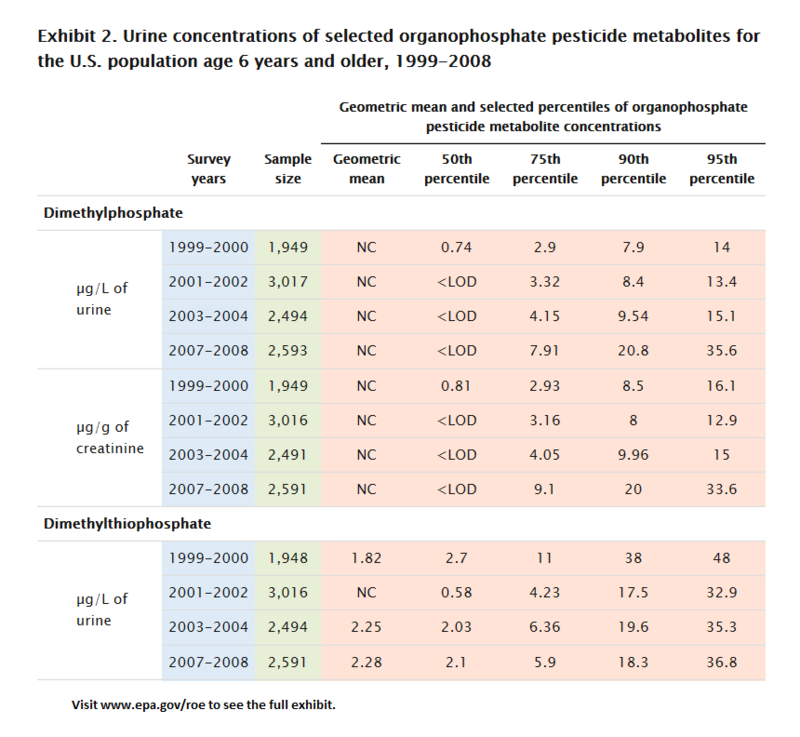 NHANES measured urinary concentrations of dialkyl phosphates between 1999-2004 and 2007-2008, which are the primary metabolites of many organophosphate compounds. Exhibit 2 presents the geometric means and percentile values for unadjusted and creatinine-adjusted urinary concentrations of these metabolites. Only three of the six urinary dialkyl phosphates presented (dimethylthiophosphate, diethylphosphate, and diethylthiophosphate) were measured with sufficient frequency above the limit of detection to calculate a geometric mean. The highest geometric means for those metabolites were 2.28 µg/L (2.34 µg/g creatinine) (2007-2008), 1.03 µg/L (0.924 µg/g creatinine) (1999-2000), and 0.484 µg/L (0.496 µg/g creatinine) (2001-2002), respectively. 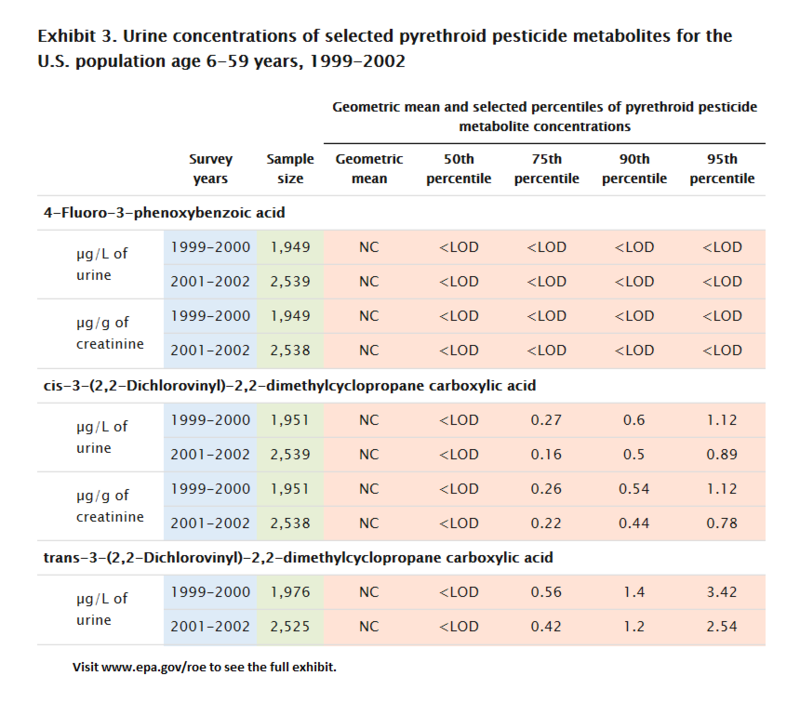 Five pyrethroid urinary metabolites were measured in urine samples from a subgroup of participants as part of NHANES (1999-2002). Only one of these metabolites, 3-phenoxybenzoic acid, was measured with sufficient frequency above the limit of detection to calculate a geometric mean. The highest geometric mean concentration of this metabolite measured in urine was 0.321 µg/L (0.316 µg/g creatinine) (Exhibit 3). The herbicides reported in NHANES (1999-2004) were not generally detected in urine with sufficient frequency above the limit of detection to calculate a geometric mean; therefore, data are not displayed. A subset of the data presented represent data from only two survey periods; changes in estimates between two time periods do not necessarily reflect a trend. As CDC releases additional survey results, it will become possible to more fully evaluate trends (CDC, 2002, 2004). Urine creatinine concentrations were used to adjust the urinary concentrations of pesticides and metabolites of pesticides in subsets of adults participating in NHANES. Traditionally, this approach has been used in population groups without much diversity. However, the inclusion of multiple demographic groups (e.g., children) in NHANES may increase the variability in the urinary creatinine levels when comparing across these different study populations (Barr et al., 2005). Health-based benchmarks for carbamate, organophosphate, herbicide, and pyrethroid metabolites in urine have not yet been established. Data used for Exhibit 1 and Exhibit 2 of this indicator were obtained directly from CDC’s Fourth National Report on Human Exposure to Environmental Chemicals, Updated Tables, September 2013 (CDC, 2013). Data used for Exhibit 3 were obtained directly from CDC’s Fourth National Report on Human Exposure to Environmental Chemicals (CDC, 2009). The underlying laboratory data supporting CDC’s report are available online in SAS® transport file format at http://www.cdc.gov/nchs/nhanes/nhanes_questionnaires.htm. Barr, D.B., L.C. Wilder, S.P. Caudill, A.J. Gonzalez, L.L. Needham, and J.L. Pirkle. 2005. Urinary creatinine concentrations in the U.S. population: Implications for urinary biological monitoring measurements. Environ. Health Persp. 113(2):192-200. http://www.ncbi.nlm.nih.gov/pmc/articles/PMC1277864/. CDC (Centers for Disease Control and Prevention). 2013. Fourth national report on human exposure to environmental chemicals, updated tables, September 2013. http://www.cdc.gov/exposurereport/pdf/FourthReport_UpdatedTables_Sep2013.pdf (PDF) (770 pp, 9.5MB). CDC. 2004. NHANES analytic guidelines. June 2004 version. http://www.cdc.gov/nchs/data/nhanes/nhanes_general_guidelines_june_04.pdf (PDF) (6 pp, 28K). CDC. 2003. Second national report on human exposure to environmental chemicals. NCEH publication 02-0716. CDC. 2002. NHANES 1999-2000 addendum to the NHANES III analytic guidelines. Updated August 30, 2002. http://www.cdc.gov/nchs/data/nhanes/guidelines1.pdf (PDF) (28 pp, 191K). Grube, A., D. Donaldson, T. Kiely, and L. Wu. 2011. Pesticides industry sales and usage: 2006 and 2007 market estimates. Washington, DC: U.S. Environmental Protection Agency. https://www.epa.gov/sites/production/files/2015-10/documents/market_estimates2007.pdf (PDF) (41 pp, 508K). Roberts, J.R., and J.R. Reigart. 2013. Recognition and management of pesticide poisonings. Sixth edition. EPA/735/R-98/003. https://www.epa.gov/sites/production/files/2015-01/documents/rmpp_6thed_final_lowresopt.pdf (PDF) (277 pp, 13.9MB). U.S. EPA (United States Environmental Protection Agency). 2003. Restricted use products (RUP) report. Accessed November 26, 2012. https://www.epa.gov/pesticide-worker-safety/restricted-use-products-rup-report.